A road in Wester Ross has re-opened to motorists after heavy rainfall brought tonnes of debris down onto the road. The landslide occurred on the A832 between Braemore and Dundonnel, two miles east of The Dundonnel Hotel, after heavy rain and high winds swept across the area; resulting in more than 180 feet of hillside trundling down onto the road. 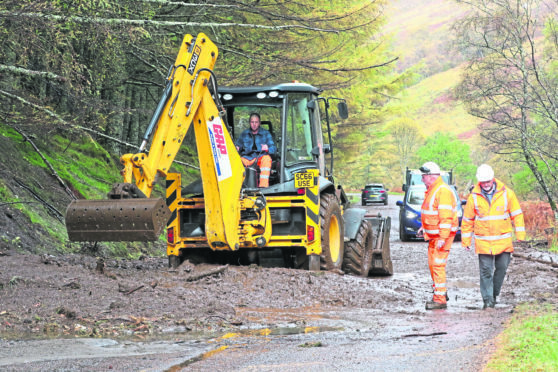 A number of workers from the Highland Council remained at the site for the duration of the afternoon in an attempt to clear the 80 tonnes of earth, rocks and trees strewn across the road. An engineer from Skye was drafted in to examine the remaining forestry surrounding the area; with temporary traffic lights remaining in place overnight following concerns for several trees remaining on the hillside. Staff at the Dundonnel Hotel – located at the foot of An Teallach – first discovered the closure after one of their residents began their 59-mile drive back to Inverness, but only reached two miles from the property’s front door. The road re-opened shortly after 4pm.